Michael Mosi worked and trained under European chefs and ground breaking American chefs in Washington, DC, Virginia and Maryland in the 1980s including the chef of the Italian embassy. He later received a bachelor’s degree from Penn State University in hotel restaurant and institutional management in 1991, with a semester in Switzerland at the Luzern Hotel School. Chef Mosi then worked around the United States, Europe and Asia until settling in Key West in 1998. In Key West, Chef Mosi worked for Chef Masa at Ambrosia to learn and practice the art of sushi and then became the chef at Antonia's restaurant in 1999. 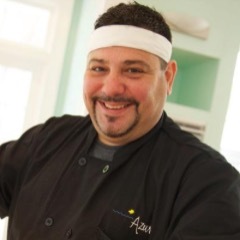 In 2007, Chef Mosi opened Azur Restaurant with life-long friend and co-chef/co-owner Drew Wenzel.